FINISHED ANOTHER UNIT FOR THE EL CID GAME POST ON THE BLOG. THIS TIME FOOT FOR THE COUNT OF BARCELONA'S FORCE. WRITE UP FOR THE BIG BATTLE TO FOLLOW SOON. 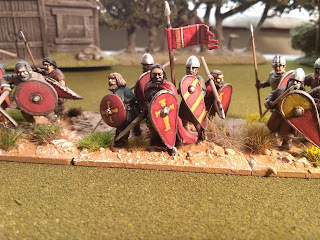 Thanks very much guys, got another couple of units to share beofre I return to the Great Northern War Project, plus the write up for a pretty big El Cid game. Very much appreciated Rick thank you.